What This Offering Will Do For You - Use the math the pros use to analyze their mail order or internet sales campaigns to insure the highest profits. You just plug in numbers and the software crunches the numbers to make your decisions fast and easy. If you are selling a product or service this program is a must. We have been active in Mail Order selling since the early 1980's and have learned the hard way how to crunch the numbers to insure a profitable sales campaign. I used my math and statistics background to figure all this out and use it for our own sales offerings. I developed this software. In talking with other marketers it is amazing how often I saw someone trying to make a profit selling a $25 product with a $35 cost of sale. They really never bothered to try and figure the cost of the sale and their profits (or lack thereof) showed it. They were amazed when I showed them how to calculate the cost of the sale and how to set the best price based on the response figures. 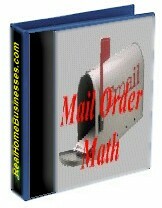 You can now benefit from all this work and crunch your mail order numbers like the pros. These programs are written in msExcel and will help you conduct price testing to set the optimum sales price for your product, figure the break even sales units, figure the cost of each sale, project future profits, set sample size for testing, figure mark ups and mark downs, predict TV sales volume from a given advertising budget, figure one in X amount of viewers to break even and much much more like email sales, traditional mail order, internet direct response, TV campaigns etc. Set your optimum price, break even price & units, cost of sales, sales & profit projections and more. If you want to profitably sell products or services directly from an ad, you need this program. Whether you sell online from a website or on ebay or with TV ads or magazine ads, ANY Direct Response marketing campaign needs this program. You don't need any special training to be successful in this. Everything you need is right here! * Get a Good Objective Look At You Proposed Campaign Before You Spend A Cent! All Files ready to Profitably Crunch Your Numbers quickly!